Pawnee City, NE, native Elizabeth "Irish" McCalla who is best known for her role as Sheena Queen of the Jungle. Jim Schaap reads "Pure Celebrity"
Henry Simpson Johnston came to Perry, Indian Territory, in 1895. He wasn't born in Oklahoma, but then most white men in Indian Territory--Oklahoma didn't become a state until 1907--weren't natives. But then, in Oklahoma even the Natives weren't native. Like so many others, Henry Simpson Johnston came west looking for America's last frontier. "I had it in my heart to be a pioneer, and this looked to me to be the pioneer spot of the world," he wrote later. He says he "put in a week wandering around looking in saloons and tents," and decided Perry, a brand new burg after the land rush, was the place to begin. Perry is rightly proud of Henry Simpson Johnston. Stop in the new Land Rush Museum, just off I-35, and you'll see him and read his story in a three-ring binder of famous locals. Henry Simpson Johnston, a lawyer by trade, served Perry as a delegate to the state's Constitutional Convention, and eventually became governor. But not for long. He got himself impeached and was back home in two years. It wasn't just another story of just another woman for Johnston, it was fear mostly that got him run out of the capitol, fear in the haunts of pious folks who thought him too fond of weird spiritualists, like those dark-skinned foreigners who practiced yoga. Yes, yoga. He had friends, you know, who did yoga--and who knew where that might lead? Was a sorry end to a sweet story, but credit Perry with remembering its famous residents, even if poor Gov. Henry Simpson Johnston fell from grace. Hospers, Iowa, could claim Charles B. Hoeven, who became President Pro Temp of the Iowa Senate and went on to 22 years in the House in Washington D. C. Alton could claim him too; Alton is where Hoeven practiced law. Neither do. Credit Sioux City for putting his name on a thoroughfare. But most small towns keep record of their famous sons and daughters. Can't help loving Pawnee City, NE, population 898. Business-wise, Pawnee City isn’t thriving right now. If you drive around the town square, you might just think hope is what they better have. But Pawnee City has the names of their famous children inscribed on a historical marker a block off the square. Stop by and read them out loud. One is Elizabeth "Irish" McCalla, the drop-dead gorgeous daughter of the town butcher. She must have attracted droves of boys from miles around, flies to honey. Irish didn't stick around. She left for Hollywood and worked in an aircraft factory until talent scouts fixated on her bountiful proportions. Overnight, she was a pin-up and a Vargas girl, then got even sweeter exposure in River Goddess, a movie that did little more than feature four young women dressed in as little as the censor would allow in 1952. 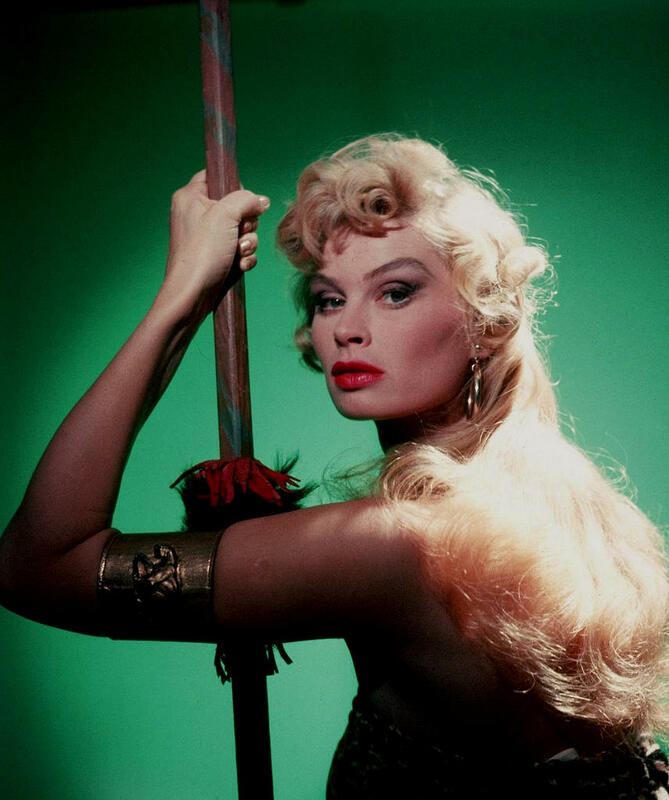 Irish McCalla, the shapely pride of Pawnee City, spent a TV season swinging from vines in Sheena Queen of the Jungle. Her name’s up there on the sign, and her star has a place on the Walk of Fame. Clothed or not so, Pawnee City is proud. There’s another name on that historical marker: Daniel Lawrence Whitney, son of preacher/hog farmer. Daniel Lawrence Whitney is up there too, right beside Irish. Whitney went to Christian schools and a Baptist college before a stint at the University of Nebraska, where he met a couple of guys from Dixie who lent him their sweet accents, the accents he uses on stage, that is. Get this: soon enough he'll be here, Orpheum Theater, Sioux City, Iowa. Irish is long gone, even though she still pulled on leopard-skin leotards and signed autographs when she was 70 years old. But Daniel Lawrence is greatly among us. He goes by Larry these days, when he leaves crowds in stitches. He’s had a wild TV career in comedy, and those who love him know him as "the cable guy"--Larry the cable guy, Pawnee City, Nebraska. You got to hand it to that little town. Right up there in bold gold, their history signs says Irish McCalla and Larry the Cable Guy. They’re Pawnee City's pride and joy. Long, long ago a massive chunk of pink quartzite was left behind in the immense wash of a turbulent inland sea. It's impossible to imagine a rock 20-feet high, 40-feet wide, 60-feet long--getting carted anywhere, but that's what happened. An ocean swept that massive thing south and east from its moorings on the outcropping of Gitche Manitou or Pipestone. In its fingers, the glacier picked it up and unceremoniously left it behind. To call it a “rogue’s gallery” just might be understatement. But first, let’s admit that distinguishing history from myth or legend is not only difficult but impossible, witnesses long gone, histories copywrited years ago. So exactly how evil these bad guys were is answerable, truthfully, only by saying they were inspiringly bad. Welcome to The Exchange on SPM. I’m MH. This week, we presented a live edition of The Exchange at the Sioux City Public Library. The topic was the effect of tariffs on agricultural and industrial products. Those tariffs were issued in retaliation for tariffs President Donald Trump announced a little over a year ago. Those tariffs focused on China but affected other countries like Canada as well.